Steep tea bag in 1/2 cup hot water for 5 minutes, then allow water to cool. If using gel from a fresh aloe leaf, split the leaf open lengthwise to expose the inner part of the leaf. With a spoon, gently scrape the gel from the leaf. Process in blender prior to mixing with other ingredients. Aloe gel can also be found in the health section of your grocery. 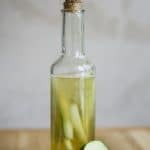 Mix tea, aloe vera gel, and cucumber slices. Dab onto clean face with a cotton swab prior to applying moisturizing, or use a spray bottle to create a refreshing mist.